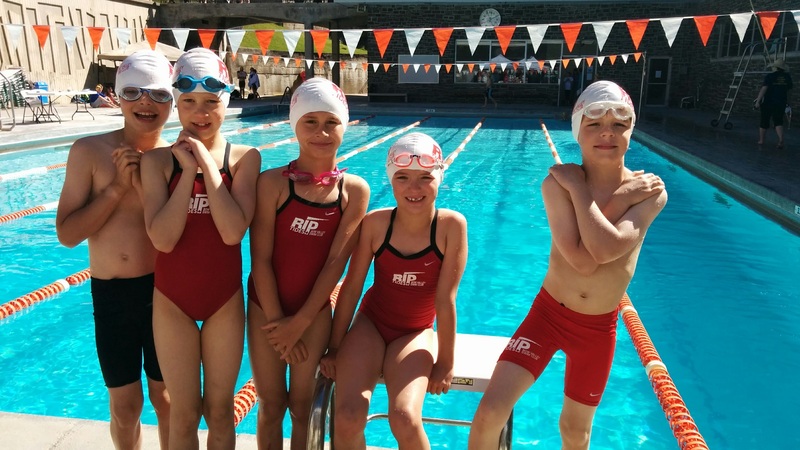 The annual December time trial challenged the Riptides to swim the longer distance events. For the older swimmers, the 800 free and 400 IM were the big events, while the younger ones swam the 200 and 400 free. 17 of the 30 swimmers competing swam a distance race for the first time. Jamie – new AB Provincial standard in the 800 free in her first time swimming the event! Renee – a massive 474 second drop in the 400 free! Ruby – first time swimming the 400 free! Next Distance Challenge will include the 1500 free and run on Feb 11 at Elevation Place. It was an exciting weekend in Calgary at the 2015 Alberta Age Group Trials Long Course. We had 13 swimmers competing and they brought back 11 medals with 3 new qualifiers for Provincials and 3 new club records. Congrats to Cassidy, Domenic and Kiana who qualified for Provincials in July. Kiana broke two of Emiko’s records in the 10&U 200 & 400 Free. 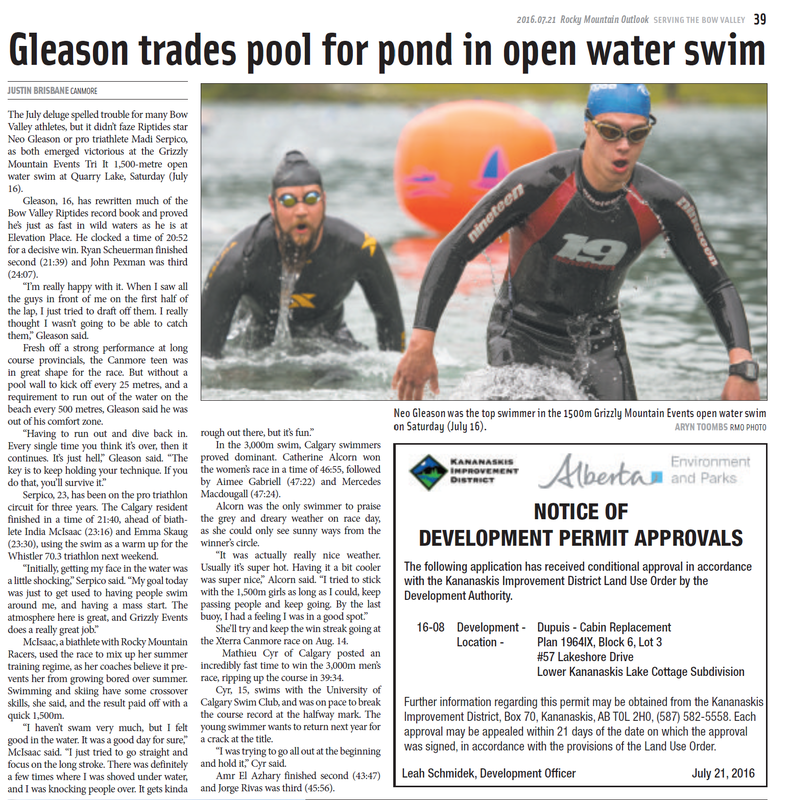 Seven swimmers have qualified to represent the Bow Valley at Provincials in Edmonton in July: Emiko, Neo, Cassidy, Domenic, Kiana, Marin and Nick. The 2015 Team Aquatic Supplies Alberta Age Group Trials were held in Calgary Feb 27 to March 1 and it was pretty exciting to watch our swimmers compete. Congrats to Marin on getting her “A” time in the 100 Fly and moving on to the Alberta Age Group Championships! Alex in 50 & 100 Free, 50 & 100 Breast, 50 Back and 100 Fly. Kiana broke two 10 and under club records in the 200 Free and 400 Free. The previous record holder in the 200 Free was Avi in 2013 at AGT and the previous 400 Free record holder was Brea Peterson at the Dino Cup in 2008. The biggest drop of the weekend goes to Josh dropping 49 seconds in his 200 Back and a close 2nd was Cassidy with a 40 second drop in her 100 IM. This weekend the team is heading back to Calgary for the 2015 Speedo Alberta Age Group Championships with 8 swimmers: Emiko, Neo, Alex, Sean, Marin and relay swimmers: Riley, Cassidy and Avi.